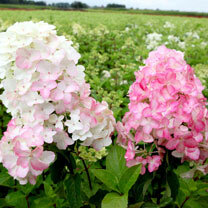 Following in the success of the popular hydrangea 'Vanille Fraise', this spectacular variety is equally impressive. The impressive conical blooms emerge ivory and gradually colour to deep strawberry pink giving a mouth-watering two-tone effect. Flowers July-September. Height 100-150cm. Supplied in a 10 litre pot.